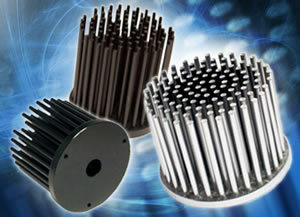 Calinar has launched a range of pin-fin heat sinks primarily designed to meet demanding LED cooling applications in the solid state lighting industry. The heat sinks are available in a wide range of diameters and heights including 2 base thickness options to give customers a variety of sizes to accommodate within the design. Surface finish is available in clear and black anodise or natural. The pin-fin arrangement ensures more efficient heat dissipation from components whilst being much lighter than an extruded profile of the same size. The heat sinks are manufactured from a solid aluminium billet and therefore have excellent heat transfer from the base through to the fins in natural convection and can be increased further using forced convection. LED’s can be attached directly to the base of the heat sinks by means of an adhesive thermal interface material, screws or clamps. There is a choice of a standard pre-drilled base and custom drill patterns are available to special order. Although initially designed for LED cooling the pin fin range can be used to cool any component where excellent thermal performance is required.